When I first started out in BJJ, I learned early on that whenever I get to the top, it is good to be heavy—that is, to apply as much weight as I can; to ensure that as much of my weight as possible is supported by my opponent rather than squandered on the ground. For a long time, however, I was sort of indiscriminate in this. Take side control, for example: I would get to side mount, apply my cross-face, drive my shoulder in, and lean my weight onto my opponent via my shoulder, my chest, maybe even my other shoulder. I am distributing my weight over a large surface area, so that he experiences moderate pressure on his jaw and moderate pressure on his chest, rather than really pinning any one part to the ground. I create a lot of attachment points, and a lot of friction, so that although it is admittedly hard for my opponent to move, it is also hard for me to move. These days I am approaching my top game with a very different strategy. Instead of indiscriminately applying my weight, I try as much as possible to pick one point where I apply it. It might be via chest-to-chest contact. It might be through my shoulder, in cross-face. If my opponent is pushing my hips away, I might pike up and drive all my weight into his chest, or his solar plexus, via my head, until I can get around his arms. But as much as possible, I make my pressure pin-point and localised. I honestly think that I can today apply more effective pressure when I am up on my toes and driving via the top of my head than I could two years ago when driving indiscriminately with my chest, even though I was then some 20–25 lbs heavier. Because the surface area is smaller, the pressure is greater (provided I don’t get lazy and apply less weight!). Thus though my opponent’s chest may be freer under side mount, his head is even more pinned to the ground from the cross-face, and since he can’t escape unless he releases pressure wherever I apply it, this is more effective. Because I use only one point to pin, the rest of my body is free to move. This allows me to play a much more responsive and mobile top game. For the same reason, I have become extremely fond of knee-on-belly for top control. It’s very much in the nature of knee-on-belly to apply pinpoint pressure (via the knee, obviously), and it’s an extremely mobile top position that very easily lets me switch from knee to knee, or between side mount and knee-on-belly. This is in fact a game I sometimes like to play when I am paired up with a beginner whom I outclass and I don’t feel it’s a contest (or very nice) to apply constant submissions: Just sweep, get to the top, and hone my positional game, where instead of stuffing escape attempts I just go with them, flow with the momentum my opponent imparts, and transition to another top position. That way I get to practice something worthwhile, and they get to practice escapes (in a manner that is admittedly frustrating, but does have opportunity for success). I do not think that it is a coincidence that this thinking has evolved in a period of time during which I have finished more armbars in an average week than I previously did in two average months. Ever since I revived that damned RPG project, I cannot help but think about a proper setting, and while I enjoy the venerable old Drakar och Demoner for many of its rules, many of its races and selection of monsters, and most especially its magic system, still the chief campaign setting (Ereb Altor) is an unacceptable patchwork of unrelated adventure settings all tossed onto one big map, and many details are altogether missing, so my campaign setting will be my own. And this is what happens when I start thinking down those lines. According to the test, and by approximating the chart positions of various figures. Tell a Christian that you are an atheist because you find the evidence for theism thoroughly unconvincing and the odds are pretty high that you will, at some point, be told that he doesn’t have enough faith to be an atheist, or that you need faith in the non-existence of gods just as much as he needs faith in the existence of his. At first blush, this sounds at once superficially reasonable, obviously false, and profoundly bizarre. It sounds superficially reasonable, because the objection that my atheism is not founded on an absolute certainty and absolute proof is of course correct. It sounds obviously false because the word “faith” is typically used to describe a positive belief in something for which there is insufficient empirical evidence, and is not a word suited to describe skepticism, whether justified or unjustified. It sounds profoundly bizarre because many Christians use the word to describe a purported virtue of trusting in the existence and benevolence of their god in spite of the lack of such evidence ( the substance of things hoped for, the evidence of things not seen ). Part of the problem is that the word “faith” is a vague one on which we may both equivocate and have genuine misunderstandings. I use it to describe belief that is not justified by rational evidence, because in any situation where there is evidence we have other words to describe it, but I recognise that anyone who uses the word in conversation with me may mean just that, or equally well something different, such as a religious belief that they perceive to be supported by evidence, as a synonym for “confidence”, or something else altogether. Then again, a disingenuous approach some debaters will use is to conflate them intentionally, a logical fallacy known as equivocation. You might say that I have “faith” that if I sit down my chair will bear me up, just as you have “faith” that your god exists—but they are clearly not the same kind of faith, since I have ample evidence that my chair will support me, and furthermore this evidence is available to anyone who wants to inspect it: You could (if you truly doubted it) have photos, videos, contemporary eyewitness testimony, or if you were truly dedicated you could come visit me and see for yourself. Moreover, the supportive quality of chairs is not contrary to anything in common experience; it’s not (as Sagan would say) an extraordinary claim. This approach is apparently used to justify the evidence-free kind of faith by implying that it is equivalent to obviously rational forms. It is not. My confidence in chairs is based on facts and observations that could be amply supported against someone skeptical of chairs; unless you can provide facts and observations in favour of your deity, it’s not the same thing at all—and if you can then let’s talk facts and evidence, not “faith”. More promising is the notion that I need faith to be an atheist—faith not quite supported by evidence, that is—just as the theist needs faith to be a theist. Some theists, indeed, are known to dismissively quip that “I don’t have enough faith to be an atheist” (by implication of which faith is a bad thing, since more of it leads to us sinful atheists—but that is by the way). However, this also falls down flat on closer inspection. First of all, we all subscribe to most of the same basic premises or assumptions in dealing with the world, theists and atheists alike. We all operate on the assumption that the external world is real and that our senses provide us with systematic information thereof. Even a hypothetical, reductio-ad-absurdam biblical literalist has no choice: Without the empirical evidence of his eyes and ears, he could read no scripture and hear no sermons. So clearly, in terms of the basic appreciation of what exists, we start from the same position. Entia non sunt multiplicanda praeter necessitatem , as Occam’s Razor slices, and I choose to stop there. I accept the truth of premises that cannot be denied without resort to solipsism, but thereafter I demand evidence before I accept anything as true. This post goes into more detail, but in brief, since it is always possible to invent an infinitude of ideas, explanations, and purported entities, my choices are always going to be either refusal to accept any without evidence, attempting to accept all of them, or picking and choosing in an ad hoc fashion. @haggholm as I think about it ur conjectures are based on faith no evidence 2 prove that God doesn't exist somewhere in the universe. The problem with this protestation is that although it is true that I have no direct evidence that no such thing as his God is floating about somewhere in the interstellar void, nor do I have any evidence that there aren’t two gods. Or three. Or ninety-six point four. Or, for that matter, a giant magic space-duck ’round whose mighty bill six supermassive black holes revolve. This shows the insufficiency of “there is no direct evidence against it” as an argument to accept any proposition: It opens the gates to all manner of silly things. I want to remain intellectually consistent, so I must approach all these disparate and sometimes contradictory claims (there is exactly one, are exactly two, three, four gods… cannot all be true) with the same approach. I do, and so accept only the ones whose existence is supported by good evidence. Therefore I am an atheist. …I were to go on to say that, since my assertion cannot be disproved, it is intolerable presumption on the part of human reason to doubt it, I should rightly be thought to be talking nonsense. Unfortunately, the analogy with biologists falls rather flat when we consider that the biologist’s inference from observation is only the first stage of scientific investigation. In the canonical simplification of scientific inquiry, this is observation leading to hypothesis formation. A biologist might for example observe cells in agar, see some interesting things, and conclude that cells reproduce by fission…but it doesn’t end there. If a biologist submitted a paper to a journal with no more substance than “here’s what I saw and here’s what I conclude”, it would be rejected and might not even receive the grace of a note explaining why. Rather, the biologist must use this point as a starting point only and ask questions. If I am right, what does that imply? What else should I be able to see? Can I follow up on that, and do I see what I expect? More importantly, what if I am wrong? What should I expect to see if I am wrong, and can I check up on that? Indeed, some very great scientific truths have been discovered thanks to ideas that were arrived at in very ad hoc fashion, but turned out to be true. August Kekulé famously arrived at the structure of the benzene molecule from a dream of the Ouroboros, a snake biting its own tail. Einstein developed a lot of ideas from Gedankenexperiments and his sense of scientific aesthetics. The ultimate source of an idea is not so very important, whether empirical observation or irrational impulse—you may observe nature and draw the wrong conclusions; you may hallucinate and by chance have a correct idea. The key is not where the idea comes from, but how we can tell if it’s correct or erroneous. This is of course the principles of falsifiability and (implicitly) replicability, two of the great cornerstones of the scientific enterprise. We accept no one’s word that something is true just because it seemed reasonable from what they saw. We expect them to explain in quantitative detail what difference their idea makes, so that we can make predictive statements and check whether it’s correct. Note that this goes beyond merely looking for consistency. I can make up all kinds of crazy ideas that are consistent with facts. I can claim that the world is such as it is because the giant magic space-duck willed it to be so, and this is consistent with facts. But it’s not an idea to be taken seriously because I cannot say “If the space-duck exists then we should observe X; if it does not then we should observe Y.” Before I accept the truth of a proposition, the existence of any entity, it must be clearly meaningful to say that it is false—and of course that meaning must turn out to be counterfactual. …The faith we've entered into is not without evidence. Much as biologists observe cellular structures so we have observed nature and from it conclude that these things have been created by God. At this stage, what’s been described is hypothesis generation. There’s nothing wrong with generating hypotheses, and no wrong way to do it (only more or less productive ones), but hypotheses must not be mistaken for validated theories, for truth. How do you know that your idea of divine creation is correct? What predictions have you (or any theist) ever made that would detect divine agency—what evidence should be sought to verify that your god created something rather than just natural processes? If you have not looked for it, then it’s not comparable to what a proper biologist does at all; it’s the brainstorming phase, not the publishable work that actually gets a scientist respect and tenure. This is also the big problem with a deist god. Certainly it violates no evidence, but nor does it leave any evidence or make any predictions. To say that there is a god, but it leaves no traces of itself for us to find, only sounds less crazy than to say the same of a magic space-duck because we are culturally conditioned to take gods more seriously. The objection to deism is also applicable to certain views of theism—that is, those that fall into the trap of the God of the Gaps. Over the centuries, some defenders of religious faith have insisted that what we cannot scientifically explain must be the work of their god—the orbits of the planets, say, or the origin of life. As Kepler, Newton et al explained orbital mechanics, these defenders of faith had to admit that the planets weren’t pushed along by their god—but “ah”, they’d say, “gravitation itself is surely the power of God”. Along comes Einstein and explains gravitation as geometry, the consequence of deformations in spacetime, and gravitation turns out not to be an intangible force after all. “Ah!”, exclaim the defenders (or their intellectual descendands), “but then spacetime must be due to God.” And so on—with every new discovery, their god is redefined so as not to conflict with facts. But this god can never generate a meaningfully falsifiable prediction, because every falsification is inevitably explained away with a new redefinition. Indeed, earlier versions of these beggar-gods, deities who would hide in any nook or cranny that science had yet to illuminate, did generate falsifiable hypotheses, such as “the planets could not remain in stable orbits but for the mystical power of God”—which turned out to be false, neatly disproving them. The only gods that remain to be dealt with are the ones with more meat on their bones—ones who generate falsifiable claims: Gods such that their followers ought to be able to come up and tell me: “These are the verifiable (or falsifiable) differences between two models of the world: One such as it is or would be with my god in it; one such as it is or would be without him.” That is a god that needs to be evaluated on an individual balance, the evidence for and against it weight—especially that against it (as attempted falsification yields better evidence than mere consistency-with-established-facts). I’d welcome such falsifiable evidence. The last time I blogged about my general position and progress in BJJ was around Christmas (well, on Christmas Eve, in fact). I’d like to take a moment to introspect and take stock, as it were. At the time, I was reflecting on the breakthrough (at long bloody last!) of attitude—of making it a habit to roll to win at least some of the time, because it’s a mentality I need to be able to switch on, and a focus on fighting between the canonical positions rather than just in them. I’d also just started playing a bit of open guard. Over the past few months, one of the natural developments of my game has been to stay much more active and mobile in my top game. I ascribe this largely to two factors: One, I have made an effort to be more active in guard passing and being ready to switch from side to side. Two, I have had occasion to roll more with very new and inexperienced people, not least since joining judo, where the focus is evenly divided between standup and groundwork rather than heavily on the latter, and where much of the groundwork addresses turnovers—so that, per mat hour of total experience, I have just done a lot more groundwork. When rolling with people whom I can more or less submit at will¹, I’ve taken to doing other things: Giving up positions to work from inferior ones, providing advise and/or opportunities to my partners…or focusing entirely on positional control, moving from knee-on-belly to mount to knee-on-belly on the other side; pivoting side mount from side to side… And while I have sometimes done this mostly because it seemed gratuitous to force someone brand new to the sport to tap out ten times in a round, it has in fact rapidly translated into a skill in its own right. Thus my top game has changed from a fairly indiscriminate effort to be heavy, placing as much weight as possible on my opponent’s upper body, to a more focused control that allows me to stay more mobile. To use side control as an example, I used to apply pressure with my chest and my shoulder and pretty much any part of me that goes on top of my opponent in that position. Now, I try to apply all the pressure with the cross-face shoulder. (Or I might be applying pressure to just one shoulder or one quadrant of the upper chest from side control or N/S; or I might apply my weight in mount differently than just being heavy down the center—and so on.) My working hypothesis is that this is not a less effective pin, in fact it may be more effective in that my weight is less distributed and can be focused more on a mechanically weak point (if I’m doing it right). At the same time I’m not so glued to the ground or to my opponent, so I’m better able to move and take advantage of any opportunity that arises. I have also, very recently, started working on butterfly guard. The breakthrough came from one of those obvious things that needed just the right kind of clear and explicit statement, unsurprisingly from Kabir, who talked about going side to side with the standard butterfly sweep. If I try to sweep left, and fail because my opponent posts or bases out, that’s OK: I can just quickly switch my hips and sweep for the other side. Heureka!, or as Huxley might have said, how extremely stupid not to have thought of that: but there you are. I’m not yet having much success with the standard butterfly sweep, as I find the sitting-up position difficult to maintain, but I’m having much better luck with half butterfly guard, and using butterfly hooks to lift and sweep whenever my opponent bases out to block any sweep. And doing this—constantly attempting sweeps with butterfly hooks—is allowing me to keep my hooks much stickier, making not just my butterfly guard but my open guard in general much harder to pass. This is an area that needs a lot of work, but then I’ve only been focusing on it for a couple of weeks. I feel pretty encouraged with my success so far. I think I’m mostly in a phase where I should keep doing what I am already doing. I am currently working on several of the areas that I knew needed work: I do a lot of butterfly; I go for a lot of armbars; and if I’m passing the guard, 80% of the time I’ll stand up for the pass. All this is as it should be: I have put a lot of hours into weak areas, and while they need more work, they’re nowhere near as bad as they were half a year ago. ¹ I’m not trying to give myself airs; it’s only natural that when I’ve been doing this 4½ years and some guy is in his first month, I’m probably going to have a substantial edge. Gracie Barra Vancouver, March 8 2012. Receiving my purple belt from my instructor, Rodrigo Carvalho. I may not feel like I really deserve it for a while yet, but it’s definitely legit and very official. I’ve written before about the notion that combat sports aren’t good for self defence, as well as the cliché that you never want to go to the ground in a street fight . Today I want to look critically at a similar statement: That while BJJ does have a subset of techniques that work in real fighting situations, such as street fights or MMA, modern sport jiu-jitsu has become too specialised and so far divorced from actual fighting as to be largely useless. There is certainly a kernel of truth to this argument, smugly though it is often delivered. Certainly, as its exponents insist, many of the bewildering new guards in high-level jiu-jitsu—spiral guard, tornado guard, berimbolo, reverse De La Riva, X-guard, 93 guard, and so on and so forth—are probably not a good idea in a scenario where your opponent isn’t trying to avoid losing points to a sweep, but trying to smash your head into the ground. Curiously, I only ever see this argument aimed at BJJ, but in actual fact it’s perfectly applicable to other combat sports as well. Judo, for example, contains a lot of stuff that is totally pointless in a street fight: Uchimata sukashi and sukui nage spring to mind, though perhaps te guruma isn’t the most useful technique in an altercation either—and what’s the point of all those turtle turnovers? Even something as straightforward as boxing has a few things, like bob-and-weave actions and the strategy of pummeling into a clinch, that work only under its specific ruleset. Yet no one seems to feel that this makes “sport boxing” any less of a fighting art. The simple truth is that a fight between high-level practitioners, just like a match of expert judoka or professional boxers, is a contest of experts, where both people have the same basic toolkit, and both people of necessity know exactly how to deal with that basic toolkit. Just as judo contains uchimata sukashi because judoka are likely to face people who will attack them with uchimata, so any combat sport will develop techniques useful for dealing with its own attacks and counters. No one developed the tornado guard to fight muggers or drunken idiots: It was developed by jiu-jitsu experts in order to defeat other jiu-jitsu experts, because when your opponent knows exactly the same set of basic positions, attacks, counters, setups, and follow-ups as you do, having something different in your arsenal can give you the edge you need. It’s not like the existence of sport jiu-jitsu means that you’ll walk into a BJJ school off the street one day and immediately start being taught the arcane ways of the berimbolo. On the contrary, most experienced practitioners—even the ones who enjoy learning all the exotic stuff—seem to stress a strong foundation in the basics. By the time you learn even one of those “useless-for-fighting” guards, you’ll have a good grasp of the basic closed guard (perfectly valid for fighting, as breaking an opponent’s posture prevents him from striking), open guard (feet on hips can control distance and protect you), mount, side mount, and back mount (all solid offensive positions), half guard (a valid step to recovering guard), and maybe a few other bits and pieces like butterfly and spider guard (and for self defence, surely we can agree that a guard that involves control of both the opponent’s hands is sound). By the time you learn the stuff that isn’t applicable in a fight, then, you already should and most likely already do know the stuff that is perfectly applicable—and you’re likely to be good at them, nor will you ever stop working them. No matter how fancy your reverse upside down quarter tornado guard gets, you’ll still be drilling basic armbars from closed guard. After all, you never outgrow the basics, even if you add to them. Now, it is true that BJJ as often trained leaves a few gaps. I think and hope that everyone who trains it realises that dealing with strikes is a skill you won’t develop by training exclusively in grappling—I know that I have some of the tools to do it (breaking posture, restricting movement, and so on), that in fact the same tools that work for grappling can also neutralise strikes—but I also know that there’s more to it; that I haven’t trained myself to use those tools for that purpose or in that context; and that if you put someone with MMA gloves in my guard, I’m in for trouble. This is of course why many people choose to do a little bit of MMA, or at least rolling with strikes involved, to see what it’s like and learn to deal with it. Maybe I should at some point. But to note that BJJ qua sport grappling without strikes is incomplete (which is true) is a far cry from validating the frankly silly idea that sport jiu-jitsu training is unhelpful. The headline pretty much says it all: “Priest Walks Out of Funeral Service Over Deceased's Lesbian Daughter”. Having denied her communion during the funeral service, the priest left the altar when the daughter of the deceased gave a eulogy, and used a weak excuse to weasel out of the gravesite part of the service. Obviously, this man need a few more courses in Theology/ Scripture and pastoral Practices. I find it a shame that people who call themselves "religious leaders" behave like this. The sad thing is that many people will not only stop attending that Parish but will stop going to Mass. They will say that all Catholics are bigoted holier- than- thou Christians. We are living in such troublesome times that we need Our Lord and Our Lady as constant companions. This priest believes that, as a matter of fact rather than personal judgement, this is precisely what his god wants him to do. He doesn’t think it’s his idea; it’s “the Lord’s”. He subscribes, in addition, to a faith tradition that condemns humans as “sinful”, so that his god’s morality by definition trumps his own: Even if he personally felt that this condemnation of homosexuality were evil, his faith and dogma inform him that he is in the wrong. Does this mean I think his behaviour is pardonable? Of course not. The moral outcome is atrocious, so clearly there was an error. I only differ in my view of where the error lay; and to me, the error lay in accepting the premises that quite soundly lead to the terrible conclusion: He believes that there is a god who wants this. My point is that the error is factual rather than one of moral judgement. If you honestly believe what he believes, then his moral conclusion is inevitable. The observation that he’s a douchebag is notable, but tangential. And here is the core problem: Belief drives action and moral conclusions, and false beliefs can drive even the well-intentioned to commit bad actions and reach poor moral conclusions. The only way someone like this priest could arrive anywhere but where he did is by either re-examining his beliefs or ignoring what he believes his god, the all-perfect creator of the Universe wants him to do. Frankly, the latter seems like a bad idea. I think it’s perfectly reasonable to take a moral qualm with this as an impetus for re-examining these beliefs. To go thence to I don’t like this particular conclusion, ergo that biblical dogma must be wrong whereas all the dogma I personally like must be true is utterly irrational. If “Are homosexuals sinful?” is up for grabs, why not “Was Jesus God?”, or “Is there a god at all?” Why not any claim derived from scripture lacking empirical backing? Rather, one should ask one’s self what premises can be reasonably assumed or deduced, and what conclusions flow therefrom. If the conclusions seem acceptable, then either your premises or reasoning is at fault, or you’ll just have to come to terms with the fact that reality isn’t what you’d like it to be. A common reaction to these situation seems to be to turn to a milder, more tolerant faith. On one level, of course, I applaud it—the world is full of people who are good people in spite of being Christian, because they prioritise their own judgement over that of their dogma, cherry-picking the parts they (with their good moral judgement) approve and rejecting the parts they do not. On another level, I recognise that it’s intellectually even more bankrupt than dogmatic blind faith because it’s ad hoc and inconsistent: Blindly believe some dogma because…the Bible says so?, but at the same time reject other dogma from the same source. Why believe the former if the latter proves the source unreliable? If you have occasion to question some of religion’s teachings, perhaps it’s a good idea to start at first principles and ask how you can know that any of it is true. Once you apply reason and standards of evidence, we atheists will welcome you to our ranks, with open arms—after all you’re already a nice person. If you choose not to question, then I suppose you face the choice of an ad hoc muddle, or taking up the entirely consistent position of the aforementioned priest. With this seminar, though, I can’t resist it, because egads, have you ever seen such a concentration of skill and accomplishment gather in one place before? On March 8, no fewer than five BJJ blackbelts are holding a seminar at Gracie Barra Vancouver, several of whom are so famous that even I, who have a notoriously weak grasp of the international competition scene, have heard of them. Since the sport lacks the centralised and easily referenced records present in MMA, for example, it’s hard to get any sense of their proper laurels—I can’t find any hint of some of their records. Two of them are so decorated that I can’t be bothered to include all their trophies, cutting it down to just Mundials and ADCC medals to save space; two I can’t find at all; one I can find only briefly mentioned. It’s a line-up nowhere short of amazing, though, and with five world-class instructors running a seminar (not even an expensive one), it’s hard to imagine not getting my money’s worth. A Twitter exchange¹ reminds me of one of the more peculiar rhetorical gambits many proselytising Christians will resort to when faced with unbelief: Just call on God’s name sincerely , or Only pray to Jesus for salvation , or similar. Now, for a believing Christian I’m sure the gesture seems meaningful: When they call on their god’s name or pray, they believe they are communicating with something. However, it is bafflingly inane to suggest this to a disbeliever. I get their meaning: They feel that if we only tried sincerely, then surely God would show us the light, or something. The reason why it is so inane is that said sincerity is impossible. I cannot sincerely talk to an imaginary being. I am an atheist; I sincerely don’t believe that there exist any gods, and so obviously any act of mine of “speaking” to any such fictional entity would be a sham, and I would be disqualified on the sincerity point. Someone who does offer a sincere prayer must have belief that there is at least some recipient of the prayer. So of course everyone who offers that sincere prayer feels validated, but it’s no victory at all because only those who had already subscribed qualified. If, on the other hand, it is not mere sloppy thinking but an intentional rhetorical trick, it’s cheap and sleazy. ¹ No, I don’t have much to do today. ² In case it’s not already clear, let me state it plainly: We’re not atheists because we dislike your god. Most of us are atheists because we realised that there’s no good evidence that any such things as gods exist; because we take the same standards of reasoning that use when determining truth in other matters, when people fervently attempt to persuade us of things, and apply them to your gods. I don’t personally feel that being an atheist makes me smarter than religious people, but I do think I apply my intelligence more consistently, to areas you choose to shelter from critical thought and need for evidence. ³ My first datum seems to represent the approach of pretending not to hear. These are the thoughts going through my head as I commute to work. For a long time, my preferred position in the guard was a very traditional one: Deep grip with my right hand in the opposite collar, left hand on opponent’s right sleeve, attack cross chokes and scissors sweeps (still my highest percentage sweep). Anticipate stand-up attempts and be ready to pendulum sweep, should the opportunity arise. If I’m on the ball and not lying flat, I’ll be on my left hip. Of course, in no-gi it’s a no-go. Without the lapel the control isn’t there. So in no-gi, I started developing a different game, where my posture control is effected by an overhook. I’ll get whichever overhook I can, but I prefer to use my left hand to overhook as deeply as I can, get on my right hip, and start pushing on the far arm with my right hand and foot, threatening triangles. More recently I’ve started adopting this same basic position in gi as well: Get on my right hip, and dive my left arm deep for an overhook, preferably securing a grip, as deep as possible, on the opponent’s far (i.e. left) lapel. I’m finding this a superior way to control posture; an opponent with a strong neck and/or a bit of skill can often sit up against the orthodox cross-collar grip, but with the overhook there’s a lot of weight on the shoulder and I’m more to the side, making it awkward for them. Additionally, I find that people tend to fight the overhook before attempting anything else, whereas with the orthodox collar grip they may just monitor it while already working on a pass. start climbing for the back, since my opponent did the hard work of killing the arm blocking me! Additionally, although I’ve never used this position as a platform for scissors sweeps, it occurs to me that the possibility ought to be there, whenever I can control the far (non-overhooked) arm—although my position on the far side of the body might make it less than ideal, as posting with the far leg should be easy (which, however, is why I think I need to play with pendulum sweeps from here!). Still, worth trying. I find it interesting how this position seems to have insinuated itself into my game very organically, necessitated by the lack of collar grips in no-gi, without my ever really thinking about it. The fact that I seem to have started developing a game centered on it feels promising. Now perhaps it is time to begin analysing it and constructing that game more consciously. Having read and tremendously enjoyed Ramachandran’s Phantoms in the Brain , I expected something like more of the same: More weird brain injuries, and more light cast by these tragedies on how the brain works by studying how specific injuries cause it to malfunction. Well, there was some of that, and there was some recapitulation of such cases from earlier works (such as the one I had already read). However, much of the book was a great deal more speculative. Ramachandran is very up front about the speculative nature of some of his ideas, and further argues persuasively that such speculation—and scientists prone thereto, such as himself—are a vital part of scientific progress: Some people have to come up with the wild ideas while others stick to hard data. Still, while he is honest about it, that kind of speculation wasn’t really what I thought I was signing up for. Ramachandran also goes on to discuss the evolution of the human brain and its function, the human mind, and discusses what makes us uniquely human as opposed to “mere” animals. Here is where Dr. Ramachandran and I must part ways, because he starts to make a lot of assertions that don’t appear to be supported by anything much at all. I’m sure he’s a very great expert on the human brain, its functioning, and its malfunctioning; but to explain what differentiates us from other animals he must of course compare us to other animals, en masse as it were. Unfortunately, most of the time he draws a comparison by explaining how the human brain accomplishes a task and then simply asserting that no other animal is capable thereof. …The self is aware of itself; it can contemplate its own existence and (alas!) its mortality. No nonhuman creature can do this. Indeed? How do you know; how can you possibly know this? Despite the enormous number of distinct events punctuating your life, you feel a sense of continuity of identity through time—moment to moment, decade to decade. And as Endel Tulving has noted, you can engage in mental “time travel,” starting from early childhood and projecting yourself into the future, sliding to and fro effortlessly. This Proustian virtuosity is unique to humans. Again, bald assertion: I have no idea how this could ever possibly be tested (short of communicating via full-fledged language, which we cannnot and may not ever be able to do with any other animal). Vital to the human sense of self is a person’s feeling of inhabiting his own body and owning his body parts. Although a cat has an implicit body image of sorts (it doesn’t try to squeeze into a rat hole), it can’t go on a diet seeing that it is obese or contemplate its paw and wish it weren’t there. And how on Earth can Ramachandran possibly know that this is true? Unless he has some evidence, obtained perhaps via some sophisticated cat scan, that he doesn’t bother to cite or provide, this again seems like a mere assertion. How can we ever know what’s going on in the mind of a cat? This, to me, just won’t do. We’ve learned over the past few decades that non-human animals can do a vast array of things that we used to think our province alone: Tool use has been observed and documented in chiimpanzees, various birds, dolphins, and elephants; great apes can learn rudiments of sign language; parrots can learn a great variety of conceptual tasks as demonstrated by Dr. Irene Pepperberg (cf. The Alex Studies ), and corvids can perform many tasks involving tool use, including some tool manufacture (figuring out how to bend a wire to make a hook) and combination (using a tool to obtain another tool to solve a problem). Dr. Pepperberg in particular has pointed out ( Alex and me ) that classical animal cognitive studies, carried out in a behavioristic framework, are very limited. The classical Skinnerian pigeon in a box is starved to 80% of optimum body mass (to maximise the attraction of food rewards) and expected to solve particular tasks in highly isolated conditions—for experimental purity, no doubt, but it’s still absurd in a way. Place a human child in the same situation—isolated, starved, placed in an artificial puzzle—and I have no doubt but that you should end up with a profoundly retarded child. Humans, we know, require an appropriate social environment to develop properly. Other social animals, presumably, do likewise. Thus, I think it’s fairly safe to assume that Skinnerian methods profoundly limit the cognitive development of animal test subjects. Even in more human environments and modern training methods, such as the model/rival training adopted by Pepperberg in training Alex and her other parrots, how can we know whether it’s optimal? Moreover, I think it is always a bit perilous to judge a non-human animal’s cognitive abilities based on its ability to perform tasks specified by humans. We humans should have a great deal of difficulty learning to behave like intelligent whales, after all, or crows! This is not to say that I believe that crows, parrots, whales, elephants, or any other non-human animal really is as smart as humans are (although with cetaceans I think it’s particularly hard to judge). Rather, I think it is perilous to simply assume that no animal can perform a certain task merely because we have yet to devise a training method and test to demonstrate it. I’m very sure that there are lots of mental task that no other species on Earth can master, but which ones, and to what degree? Yet here Ramachandran seems quite happy to simply assert, apparently on the assumption that his claims don’t even need justification. (They do.) If these were mere asides, this would be very irritating but harmless. As it is, though, he also uses these assertions to speculate on the evolution of the human brain: We humans can perform task A; we use brain region B to do so; other great apes cannot do A and lack the specialised structure B, ergo some inference regarding hominin brain evolution. This is very problematic, because without actual evidence that the ability is unique to humans, the evolutionary scenario is unsupported. Keep in mind that the same function may be solved using different structures: Feathers and skin flaps do the same job (in birds and bats respectively); a talking bird uses a ‘whistling’ syrinx to approximate sounds that we humans produce using larynx and tongue and vocal cords; there’s even evidence (I think in The Alex Studies ?) that birds may solve problems using quite different brain regions than mammals would for the same tasks. In the areas of the book dealing strictly with the human brain, its functioning, its malfunctioning, and thus our comprehension of its structural functionality, Ramachandran is once again stellar, and I have learned some more fascinating things. However, his anthrocentric chauvinism reduces many of his speculations on evolution from fruitful hypothesising to mere speculation based on a combination of observed fact (with regards to the human brain) and mere authorial assertion. Had he either stuck to his area of expertise, or broadened it, the book could have been stellar. As it is, its flaws (peculiarly tailored to annoy me in particular as a reader) leave me feeling rather cold, especially compared with the brilliance of his earlier work. After four years and an extremely belated start, this month saw me participate in my second-ever BJJ tournament, Grapplers Inc. on February 4, 2012. This time I’ve been eating pretty well for a few months, and so with no need to drop any weight I was comfortably in the middleweight division, instead of the inappropriate medium heavyweight division I was in last time. I knew I had improved since the last competition; I was fitter, stronger, more technical, and more active on the mats. The result? Unfortunately, I ended up inside a strong guard that I just wasn't able to break. I think, and in fact I thought even during the match, that I should have stood up to break the guard, since he was clearly breaking my posture whenever I tried to get leverage to open the guard kneeling; however I don't work enough standing guard passes and decided I was too likely to get swept, and should therefore stay down and play more conservatively. Right or wrong, that's where I lost the match. I briefly thought I was going to pass to half guard, but he nearly caught me with a sweep in the transition, and as I scrambled to regain posture he caught my arm. The next few months will be on the theme of standing guard passes. What I didn’t say in that description is that unlike the other tournament, this time I’m slightly unhappy with the result. Not that I care so terribly much that I lost—after all there are always better guys out there, and I’m not a natural athlete so I think just getting to the point where I can make myself compete in such a physical event is pretty significant. Still, I wish it hadn’t gone like that. I’ve made tremendous gains since the early autumn, thanks to registering for that first tournament; and I’ve continued to improve since then. I know that I’m better than I was in November—in better physical condition, faster, stronger, and with a much more active and cohesive game. I have better jiu-jitsu! But you can’t really tell from that video, where I got stuck doing largely nothing. That is irritating. It’s irritating. I’m irritated, and a bit frustrated. It may be, though, that this frustration itself is mostly a good thing. I feel this way because I know that I’ve improved, and because I have gained some confidence in my game. In November I had no idea what would happen: I just wanted to get my first tournament out of the way. This time I knew that the odds were perhaps against me (because, having waited so long, I have very little competition experience for a blue belt), but I also knew that I had a game and things I wanted to do. Then, too, I left the tournament with a feeling of I do not want this to happen again! I want to compete again, and win or lose I do not want to spend another match just stuck in the guard like that. I want to spend the next few months working my standing guard passes so that if I end up in the same place, I will smash that guard; and if I lose, it will at least be different. The last tournament just got me introduced to the idea of competing; this one exposed a big hole in my game, pointed, and laughed at it like Nelson Muntz. My only fear is that I may get promoted too soon. Be it via franchise rules because I’ve been toiling along for 4½ years, or the same principle as a ‘sympathy D’, I fear the possibility of receving a belt I don’t deserve at the big several-multiple-world-champions seminar next month, preventing me from competing at blue belt again. Ah well, hopefully such nightmares won’t come to pass. There should be another big tournament locally in May or so, and I want to be there. Hopefully, too, I’ll find a chance to compete in judo at some point this year. At least here it’s not too late; a mere orange belt, I’m very much a nobody and should be able to get my first-tournament jitters over with in this sport at a fairly early stage! Suppose on the one hand that we have a mad serial killer who wishes to strap me down and slowly pull out all of my fingernails with a pair of pliers; not because it pleases him per se, but because he feels that I deserve it and that, given my beliefs and lifestyle, this is the best and fairest thing that can possibly happen. Suppose on the other hand that we have a Bible-believing Christian, who subscribes to the fairly orthodox beliefs that there is a God; that this God is omnipotent, omniscient, and omnibenevolent, and created the Universe; that there is a Hell of unending torment; and that people who do not believe in this God will go to this Hell. It follows, therefore, that said Christian—and while many, many Christians are not like that, we can surely agree that those beliefs are not mere hypotheticals—is rather like the serial killer in that he feels that the best and fairest thing that can possibly happen to me, qua that which will in fact happen in a world created and governed by a just, loving, and omnipotent God, is that I will suffer torment. The two are alike—the mad serial killer and the Bible-believing Christian—in that both believe that, given my beliefs and lifestyle, it is good and just that I should suffer torment. The serial killer, though, only thinks that I deserve the torment of having my fingernails pulled out with pliers. The Christian is not so easily satisfied: To him, the just and good torment is infinite both in magnitude and duration. ∴ In a Universe designed, created, and ordered in the fairest and most loving way possible, the consequence for unbelief is infinite suffering. ∴ Infinite suffering is a just consequence for unbelief. Ergo, either there’s a flaw in my reasoning (please point it out); or a Christian who is also a good person must reject at least one of the premises; or they must refuse or fail to follow those premises to their conclusion. Personally, I think that the latter is most likely—as you may know, I believe that the device that allows people to hold religious beliefs is compartmentalised thinking, where these beliefs are not held to the same standards of scrutiny, reason, coherence, and evidence as are beliefs in other walks of life. That doesn’t speak too highly of the matter, though, and doesn’t resolve the dilemma of what such a believer should make of it if confronted. Another common resolution is of course to simply reject the premise that unbelief merits Hell, or to reject the Hell doctrine altogether. That’s a better moral solution, though I’m not sure how it helps intellectually. In rejecting some of the doctrines of the Bible, after all, you thereby reject the Bible itself as an authorative document, meaning that its teachings are subject to external reason and evidence to ascertain what’s true and what’s not; whereby you’re left rejecting the reliability of the only source for the whole God-and-Jesus bit. But more on that at some other time. ¹ Mark 9:46: Where their worm dieth not, and the fire is not quenched. ² John 3:18: He that believeth not is condemned already, because he hath not believed in the name of the only begotten Son of God. For some reason, liberal Christians aren’t nearly as fond of citing this as the earlier 3:16 bit about how God so loved the world . 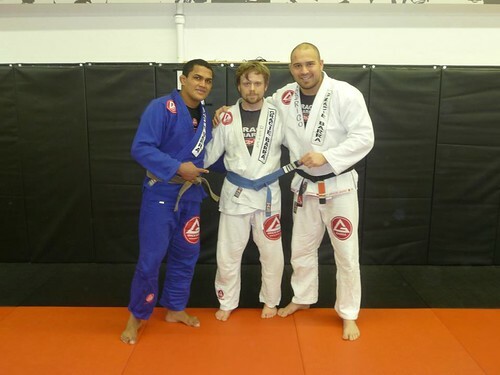 I first started training BJJ at Tim Shears’s Cocoon Athletics in October, 2007. For the past four years I’ve stayed with the same club, though it’s no longer either Tim Shears’s club nor Cocoon Athletics; it’s moved, ownership has changed, and the roster of instructors has changed as well (though Tim still teaches the occasional class). I got my blue belt in May 2010; the other day, December 19, I got my fourth and final stripe on that belt (I think, perhaps, the first promotion I ever got earlier than expected); the next promotion, whenever it comes, will (necessarily) be to purple belt. The learning curve has been both slow and steep for me. I’m not by nature either athletic or competitive, and physical learning is not my forte. Still I’ve learned, and my fourth year has been, by far, my best year yet. I feel like the first two years were pretty much a matter of learning the bare basics—the positions and positional hierarchy, a basic toolkit of techniques. My third year, during which I received my blue belt, was when I had my first period of Getting It, and I started developing sensitivity and the ability to respond and react to people—rather than just thinking in explicit terms of “I’m in position A, I’d best use technique X”, I learned to feel what my opponent was doing, where their weight and momentum were oriented, and reflexively respond to that. 2011 has been a year of much greater development. I didn’t blog very much early this year, and the first BJJ post of 2011 is from April, so I don’t know what was really on my mind in January, but I do know that something I focused on a great deal during the earlier half of the year was staying active. It’s in my nature to be passive, defensive, and reactive. For better or for worse—often the latter—this is intrinsic to how I tactically approach anything, be it jiu-jitsu, fencing, chess, or a game of Starcraft. I want to build up a solid defence and wait while I wear my enemy down by countering all their efforts. Unfortunately, in BJJ (and for that matter in fencing, Starcraft, and perhaps even chess) this is usually a losing game, as I give my opponent far too many opportunities to find and exploit my weaknesses. It is necessary, at least when appropriate, to be active and assertive. At the very least, if my plan is to wait for you to make a mistake and expose a weakness, I should be ready to exploit that weakness, attack it, and take charge of the game! I wasn’t. These days, I’m better at it. It’s not so much the competition itself—maybe I’ll enjoy it, maybe I won’t; I’m hoping I will but don’t have high hopes (I tend to get too nervous when competing in anything to enjoy it). Still, it will be valuable experience and both the training leading up to the tournament and the tournament itself will force me to address the biggest weakness in my game: The lack of will and drive to win, the tendency when things go south to lie back and go "Meh, what does it matter? It’s just rolling". What else—we’ll see. This all paid off in spades. Actually I had fun at the tournament. I may never be the kind of guy who drives around the Pacific Northwest seeking out every possible tournament, but I plan to compete again when it’s local and convenient—meaning, in all likelihood, in February. But more importantly, it really did elevate my game to new levels, even if I did lose decisively in both the light heavyweight and open weight divisions. At Kabir’s advice, I make it my general habit to try to win the first roll with any new opponent, even in a regular class. Of course this does not mean that I go 100% speed and power every time, nor that I am out there to smash beginners into the ground; but I do try to approach the very first roll with any training partner by bringing my A game, as it were, and trying to win. This ensures two things: First, that I keep the A game in some sort of shape—if I only ever rolled to work on my weak points, I’d lose my strengths from disuse! And second, that I get into the habit and the psychology of approaching a new opponent as someone whom I want to defeat. For someone who, like me, tends to be much too passive and non-competitive, this is extremely valuable. I have begun to fight between canonical positions. This is something I should have been doing since white belt day one, more or less, but haven’t worked nearly enough on until recently. It was seductively easy for me to think of BJJ as a game played in certain configurations—guard, half guard, butterfly, mount, side control, and so on; and that’s it. No! Wrong! Bad! Half the game is between positions; half the game is getting to them or escaping from them, and if someone passes my (closed) guard that’s no reason to resign to fighting from under side control—it means I should fight from open guard, half guard, and (more crucially in this context) a hundred ad hoc, between-position scrambles for which there are principles but no official names. As what might be considered a corollary to this, Kabir observed that I tend to hold on to my closed guard too long. When I refuse to open my guard until it is physically broken open, it means that by the time my guard is open, my opponent already has their grips set and are already in the process of passing. Of course, the reason I tend to keep my guard stubbornly closed is because my open guard is very weak…but of course it’s bound to be, if I only ever play open guard from an already-losing position! Thus on Kabir’s advice to open my guard earlier I’ve spent more time doing so, and extrapolating from this, generally bailing out of positions before I really lose them, when I still retain enough control to retreat to another position—closed guard to open guard, yes, but also open guard to turtle, and so on. Quite suddenly my open guard game improved radically and I’m much harder to pin down in side control. There’s lots of work still to do in this area, but the improvement was pretty drastic. The name Kabir appeared a few times above, and is significant. He’s a purple belt who has trained at the gym for a long time, though he was gone for a year or so while attending law school in the States; now he’s back and spending much more time (it seems) at the gym, training and coaching and what not. He’s also always taken time to help me on a very individual level. I’ve known for a long time that if ever my Facebook status updates hint at a specific issue in BJJ, I’m very likely to get a comment from him with applicable advice. With him back at the gym, I get much more of that, and it’s invaluable. Rodrigo is a good instructor, but I suppose when overseeing hundreds of students it’s hard to pay detailed attention to every single one—let alone some athletically unremarkable specimen who’s unlikely to take home tournament gold medals and prestige. Be that as it may, Kabir always has both time and apt advice. I suppose in terms of my jiu-jitsu, Rodrigo and the other instructors serve to teach me techniques and generic strategy, while Kabir (very much a coach!) has helped address my game. He’s also one of those guys with whom rolling is itself a lesson—he’s obviously far better than I am and so able to provide enough pressure and challenge that I have to work hard 100% of the time, but chooses to rarely press submissions and never pin or stifle me so much that I am frustrated. I’m much better at it—barring the obvious exception of going from zero to nothing when I first started, I may never have improved so rapidly as I have in the last several months. I have addressed several attribute and psychology types of problems, not completely but with fair success, viz. I am no longer so passive, and I no longer concede positions. I have gained pretty decent defensive skills from bottom positions, and while I need a lot of work on my half guard sweeps, I have a fair bit of success in recovering half guard from under mount, side control, and back. For the first time I’m starting to feel some degree of confidence in my skills. I still have moments of poor self esteem where I am bothered that I am challenged (or beaten) by white belts, where it troubles me that more athetically gifted people join the school and advance in skill much faster than I did…but (notwithstanding truth in the above) I’m really not at square one anymore. I hope this can continue in and throughout 2012. I have a list of skills, by position, that I need to keep un-rusted for my A game and ones I need to work on or add to my game, so I have concrete points to work on. (I always feel it’s important to have concrete points; rolling “just to roll” feels much less productive. Still a lot of fun, but less productive than specifically addressing particular skills.) There’s a local tournament in February where I hope to compete, and thanks to Jaimie I’ll be signing up for a lower weight bracket this time. I should do better at middleweight—it’s no good being at the bottom of light heavyweight, by beer belly, when the other competitors in that bracket cut their last few percents of body fat to squeeze down into it! But first, enjoy Christmas, get back and work off the Christmas rust and fat, keep addressing my list, go to a second BJJ tournament, and learn a little bit of judo.